to be supposed tosollenThe evening is cool, and the sun has set here in the southern hemisphere. On the terrace just a few metres away, a fire has been lit. Five boys arrive, each carrying a drum. They place the drums around the fire. The drum skins are now facing the flames. “Why are they doing that?” I ask one of my travel companions. “They’re heating up the leather,” is the answer. “It will give the drums a richer sound.” More boys arrive. They set up two xylophones and unpack some drumsticks and rattleRasselrattles. They are not in a hurry, but I am. I’m really looking forward to hearing them play. I’m impatient — and suddenly, I realize that my impatience is completely out of place. Suddenly, I realize that my impatience is completely out of place. The band members are standing around the fire, talking and checking their drums. The moon is shining. We are surrounded by densedichtdense bush. Behind us, the lodgeHütte, Häuschenlodge is quiet. My group and I are the only guests. There is nowhere else I want to be tonight. It doesn’t to matterwichtig sein, Bedeutung habenmatter if the band starts playing in five minutes, in ten or in 30. It really doesn’t. I lean back in my chair. Welcome to South Africa. Welcome to Limpopo, to be more precise. Limpopo is South Africa’s northernmost province and one of its poorest. It is bordered by the Limpopo River, the second-largest in Africa and known in English literature as the scene of Rudyard Kipling’s short story “The Elephant Child”. The region, however, has not attracted much tourist attention so far. Usually, visitors just pass through on their way to the famous Kruger National Park. But are they missing something? That’s what I’m here to find out. He has been running the band for ten years now, with different boys coming and going. To him, it’s important to provide them with a counterpointGegensatzcounterpoint to the predominantvorherrschendpredominant modern and often Western music. But music is not the only thing Thomas teaches. He invites us to visit his studio the next day, where he works as a woodcarver. The first stop the next day is the township of Tshikota at the edge of the town Louis Trichardt. On my way there, guide Musa Matchume explains that during apartheid, black people were forced to leave their homes in the more attractive areas — usually in big cities — and were sent to live in townships. “Black.” I to cringezusammenzuckencringe as he uses the word. But, coming from him, it doesn’t sound offensive. Black and white people still don’t have the same opportunities in South Africa, and the distribution of wealth is far from equal. It was only in 1994 that Nelson Mandela was elected president and apartheid finally came to an end. Although Tshikota is not a slum like South Africa’s most famous township, Soweto, it’s still a very poor place. The houses are small, and the few larger ones are surrounded by barbed wireStacheldrahtbarbed wire. There seem to be lots of people around, and children are playing on the road. “Not many people here have jobs,” Musa explains. We learn that, as opposed to townships, villages are settlements that were established a long time ago and are inhabitedbewohntinhab­ited by only one ethnic group. They are headed by a chief. Musa takes us to Phadzima to show us a few features common to villages in the region: the houses have electricity, but no running water; there are small N.Am., Klohäuschenouthouses in the gardens and tapWasserhahntaps along the main streets; people grow vege­tables, mainly maize. We visit the local millMühlemill, where the villagers take their dried maize to be to grindmahlenground. It’s a sunny day, and there are women sitting in the shade of the buildings and trees. They use large sieveSiebsieves to separate the flourMehlflour from the branKleiebran. Others are still in the process of washing the maize. They laugh at the interest we show in this ordinary task. For another impression of daily life in Limpopo, we visit the market in the town of Thohoyandou. The stallVerkaufsstandstalls are lined with pileHaufenpiles of colourful food, including roasted insects and Raupe, Larvegrubs. Termites, by the way, taste slightly salty. Apparently, they are a popular snack that is often enjoyed in front of the TV. There are also a few traditional healerHeiler(in)healers at the market. I talk to one of them. The man says he is 90 years old, and that he mainly sells plants which work as aphrodisiacs, but that can also be used against coughHustencoughs, to obtain nice skin and so on. A collection of dried roots is displayed on a clothTuchcloth on the ground. It seems as if there is nothing he can’t cure. I ask our guide whether people prefer modern or traditional medicine. “It’s usually a combination,” he says. “Like with religion: most people here are Christians, but they also still live by their traditional beliefs, because, well, you never know.” He smiles. After a quick lunch, we go to the Arts and Culture Centre in Thohoyandou to meet Avhashoni Mainganye. Avhashoni is Venda, one of the dominant ethnic groups of the area. The Venda are known to be excellent woodcarverHolzschnitzer(in)woodcarvers, but Avhashoni moves freely between different media. He shows us some politically loaded paintings in angry colours as well as a small, peaceful stone carving, which represents a reader immersedversunken, vertieftimmersed in a story. It doesn’t take long before we are talking about apartheid. Back then, he says, the government bought a lot of traditional art in support of black artists. The idea was to keep them busy and make them dependent on the authorities. This way, they did not use their art to encourage political change. It was easy to earn money as an artist in those days. I ask Thomas, the leader of last night’s band, about this, and he goes even further. He says he misses the government money he received in apartheid times and that life has become harder for him. He feels disappointed by the present government, which, in his opinion, now funds music much more heavily than art. Thomas is not completely on his own. He works for and with Madi a Thava, the lodge where I am staying, which is run by a DutchniederländischDutch couple. Apart from offering accommodation, they promote and sell the work of local artists and provide them with training in marketing and sales, helping them to stand on their own feet. It’s one of quite a few businesses like this in the region — and both sides seem to profit from it. Thomas, like Avhashoni, is Venda, and his speciality is woodcarving. Large pieces of wood are scatteredverstreutscattered across his land. Some have already been transformed into sculptures; others are still waiting — or rather, Thomas is waiting. The wood Thomas uses for his art and his instruments comes from the hills around his gallery. He also reuses wood that others have thrown away. His large xylophone, for example, is made of an old school desk. If you look closely, you can see the marks that pupils made on it years ago. The new day begins with a two-hour drive. As we pass through different villages, we see lots of people walking around, talking, carrying things and selling vegetables from their gardens at the roadside. Some of them mistake us for a bus and signal us to stop. They lower their hands when they see that our car is full of white people. It’s a strange feeling. I’ve never been so aware of the colour of my skin. At midday, we arrive at Mapungubwe National Park. From 1050 to 1270, this was the centre of South Africa’s first indigenouseingeboren, einheimischindigenous kingdom. ivoryElfenbeinIvory and gold were traded with Egypt, India and even China in return for goods like porcelain and glass beadsGlasperleglass beads. It is believed that a change in climate caused food shortageKnappheitshortages and eventuallyschließlicheventually forced the people to leave. Archaeologists discovered the site in the 1930s, but the findings were kept quiet during apartheid, I am told, because black people were meant to think they were inferiorminderwertiginferior. They were not supposed to know that they had had an advanced culture at a time when Europe was essentially still stuck in the Dark Ages. Luckily, things are different today. Black people were not supposed to know that they had had an advanced culture at a time when Europe was essentially still stuck in the finsteres MittelalterDark Ages . We climb a steep staircaseTreppenaufgangstaircase to the top of the hill. It’s the secret path the king’s wives used to take, carrying water and food. Our efforts are rewarded by a fabulous view: the savannah stretches to the horizon; baobab trees stand large between the smaller trees, grass and bushes. Below us, I make out two zebras, and a bit further away, a giraffe. Johannes draws our attention back to the hill itself. He points out large holes carved in the stone — places to keep food and water — that used to be covered with large wovengewebtwoven matMattemats. Then we see a series of small holes, which were used to play a game. He also tells us that 23 graves were found on the hill. Three of them were different from the rest: the bodies were buried in a sitting position — a sign of royaltyhier: Mitglieder eines Königshausesroyalty — with a wealth of treasureSchatztreasures around them. The most famous object was a small golden rhinoceros, now on display in the park’s information centre. A few hours later, the sun sets over the savannah. It’s the time of day when the animals begin to move more freely. Johannes takes me on an evening nature drive, and we see a family of elephants picking leaves from the trees, a gnu, herds of zebras and impalas, and a yellow-beaked hornbillGelbschnabeltokoyellow-beaked hornbill. single fileGänsemarschsingle file behind him. Now and then, Leonard asks us to stop. He listens, then points. We see a family of elephants a few hundred metres away. We see zebras and giraffe, a gemsboksüdafrikanische Oryxantilopegemsbok, kudu, the paw printPfotenabdruckpaw print of a lion. Most of the time, I find that I am holding my breath with excitement. When we sit down for lunch on some rocks overlooking a waterhole, I ask Leonard to tell me a bit about his job. He says that for him, the most important thing is to encourage locals to see the park and learn about their heritageErbe, Traditionheritage and the wildlife. He wants them to be proud of Mapungubwe. Then he starts talking about the various animals that live in the park. His knowledge is profoundfundiert, umfassendprofound, and his passion for conservation resonatemitschwingenresonates in every sentence. Later that day, and a few hundred kilometres further south, we meet another nature expert: Samson Mulaudzi. His special area of expertiseFachgebietarea of expertise is birds. As we cruise along the Luvuvhu River in a batteredramponiert, verbeultbattered little boat, he points out goliath heronGoliathreihergoliath herons, African darterAfrikanischer SchlangenhalsvogelAfrican darters, little grebeZwergtaucherlittle grebes and many other species. As the sun sets, I decide to ask him to tell us a traditional story. after allschließlichAfter all, the Venda people are famous for their legends. Not far from here, he says, is Lake Fundudzi. Once there was a village where the lake is now situated. One day, a man arrived in the village. The man had leprosyLepraleprosy. He went from house to house asking the villagers for food, but the people closed their doors and refused to help him. The man had magical powers, however, so he to curseverfluchencursed the village, and the water rose around it. The people are all still there, Samson says, and sometimes you can hear them talking or playing the drums beneath the water. It’s a story about karma, African-style. The next morning, I meet Irma van Rooyen, an artist who moved from Johannesburg to Limpopo in 1983 to take over a farm with her husband. When she noticed how beautifully the local Tsongan people to embroiderbestickenembroidered their clothes, she saw an opportunity to help them and to set herself a task far more interesting than farmwork: Kaross was born. The concept of her company in Letsitele is quite simple. People pick up a box containing yarnGarnyarn of different colours and a piece of cloth with a patternMusterpattern printed on it, designed by Irma herself. The employees, who are mainly women, then embroider the cloth according to the pattern. They can do this while attending to other things, such as looking after their children or sitting at a bus stop or during a break in their farmwork. Some of them embroider only one piece per month, while others may take several pieces and finish them in a week. The work fits flexibly into their lives and often provides much-needed extra income. Because they can do the work wherever they like, they don’t have to take a bus or taxi to a specific workplace every day, and this, of course, saves them a lot of money. Irma shows us around the company, where people are busy to sewnähensewing the finished embroidery on to bags, cushions and tablecloths. It’s a buzzinggeschäftigbuzzing business she has here, and despite her passion for art and the local people, I do get the feeling that it’s perhaps a bit more than a win-win situation on her side. I start thinking about this. The jobs Irma provides certainly help the locals, who would otherwise have no income at all. On the other hand, the power and probably the majority of the money are still firmly in Irma’s white hands. Is that a bad thing? At this moment, it would be hard for Irma to find an indigenous successorNachfolger(in)successor with the right skill setKompetenzenskill set to keep the business going. But she is working on it: Kaross also has a foundation that supports the children of its employees in their education. So all things considered, Irma is doing a lot more for these people than I ever will. At midday, I arrive at Sefapane Lodge in Phalaborwa, on the eastern border of Kruger National Park. Then I board a minibus to go and explore the town. There are moments during the tour when I feel as if we were on some kind of “human safari”. “See that woman over there?” our guide calls out and to slam on the brakeseine Voll- bremsung machenslams on the brakes. A woman is cutting reedSchilf, Rohrreeds at the side of the road. “She’s collecting them to make a mat or a bag,” he explains. “People make use of everything they can find: they catch fish, they collect plants.” It sounds almost as if he were showing us some rare animal in its natural environment. The woman doesn’t look up from her work as we stare at her through the windows of the bus. I feel bad. I don’t take a photograph. She signals to us to be quiet. The song ends, and Bridget makes an announcement. She switches between Sepedi and Tsonga ­— the two main local languages — and then to English so quickly and easily that I can hardly believe my ears. She answers the phone, has a chat and then puts on another song. “I love my job,” she says with a huge smile. As I pack my bag that night, I think back on my journey. It has been full of fascinating people, beautiful art, nature and wildlife, but I’ve also learned about the continuing after-effects of apartheid and seen the poverty people have to to endureertragenendure. There is a lot to discover in Limpopo — and a lot to think about, too. Car rentals and transfer: You can hire a car at the airport or book a transfer — or even a driver and minibus for your whole journey — from a local tour operator such as Vula Tours. Madi a Thavha Mountain Lodge is close to Louis Trichardt and lies in a valley surrounded by native bush. Leokwe Rest Camp lies within Mapungubwe National Park. Shiluvari Lakeside Lodge lies by the Luvuvhu River. Sefapane Lodge is close to Phalaborwa and Kruger National Park. Find out more on South African Tourism’s official website. 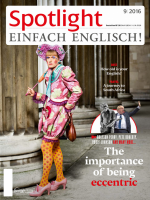 Dieser Beitrag stammt aus dem Spotlight-Magazin 9/2016. Die gesamte Ausgabe können Sie in unserem Shop kaufen. Natürlich gibt es das Magazin auch bequem und günstig im Abo.